We were delighted to work with the architects at Studio Bark in the UK to help them conceive and then build a building made from expanded cork blocks. You can read about the expanded cork building project here – the short version is that they used a mixture of high density expanded cork blocks for the walls (because they are waterproof) and standard density expanded cork blocks for the roof and floor (because they offer superior insulation). They left the expanded cork completely exposed externally and internally – at the time of writing the building has been lived in for a Summer, Autumn and the beginning of a Winter and has stood up to the elements no problem. Generally expanded cork is hidden inside walls and used only for its insulation properties, but increasingly we are getting clients who want to have their expanded cork exposed either externally or internally – it is worth noting that expanded cork will very slowly lighten in colour as it is bleached by the sun, but we have cases here in Portugal where expanded cork has been used as external cladding and is still going strong 30 years later. If you have expanded cork on the inside of buildings, you will notice a slightly resinous odour (it is similar to the smell of other resinous trees when they are cut),but it fades with time and is not very strong. The final issue is that standard density expanded cork can become damaged by impacts, so exposed edges in particular can be vulnerable; the higher density expanded cork is considerably stronger though. 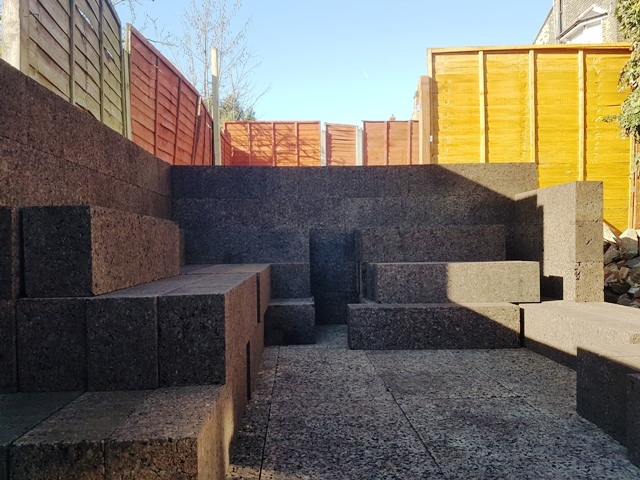 We supplied Studio Bark with blocks cut to size, which you can see in the photo above – the maximum size we can produce is 100x50x30cm in standard density; in high density it is 100x50x18cm. In this case we provided a variety of different sizes. The architecture magazine, Dezeen has just done an article about this project if you would like to read more; if you are interested in doing a similar cork building project or other cost-conscious environmental architecture projects, then Studio Bark will be happy to provide design support – see the Studio Bark website.